After a couple of busy days settling back into the house & getting on top of a few things I needed to do, I decided to get back out on the bike this morning. After a couple of days of gardening etc. the bike was calling me! I had an appointment with my neighbour to pop to the Recycling Centre (furniture hunting) at 2, so today wasn’t a day for a long ride. What I needed was much more of a gentle potter with a nice coffee stop. 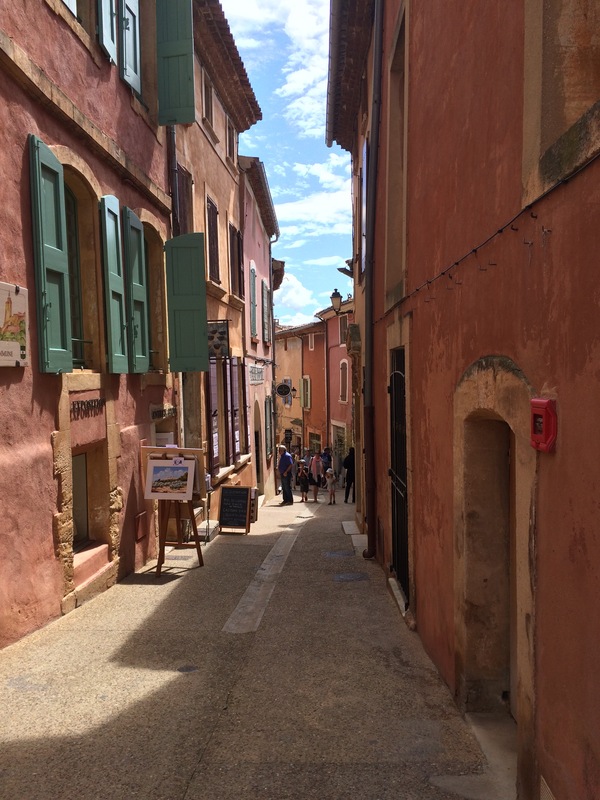 There’s lots of options I could have taken, but my first thought was to head up to the colourful village of Roussillon and then make my way back along part of the ‘Circuit des Ocres’ cycle route via Saint Saturnin. 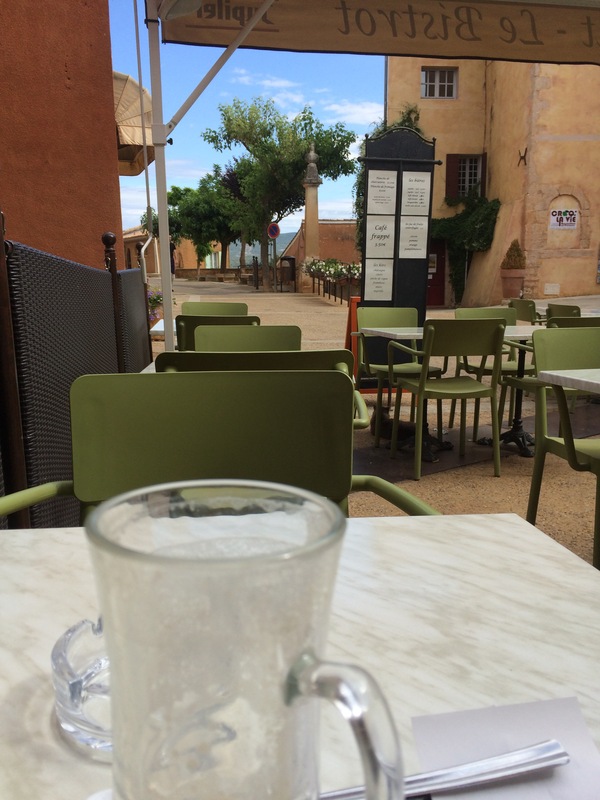 It doesn’t matter how many times I visit Roussillon I never tire of its vibrant colours & the spectacular views and there are plenty of cafés, where I can sit & watch the world go by over a coffee, so it felt like a perfect choice for a morning’s ride. 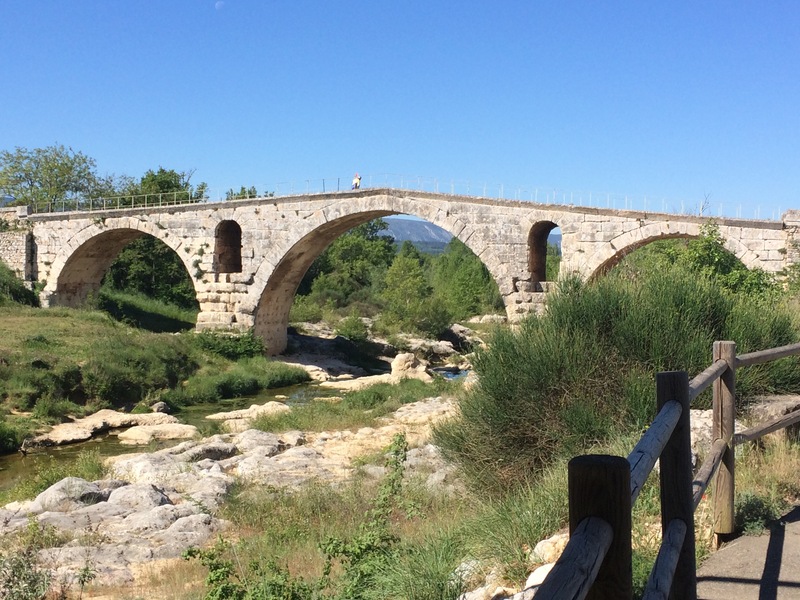 As ever the ride begins on the Veloroute du Calavon & I cycled out through Apt to where I turn off at the Pont Saint Julien, near Bonnieux, which is a pretty, old bridge that was built to carry the ancient Via Domitia over the River Calavon. 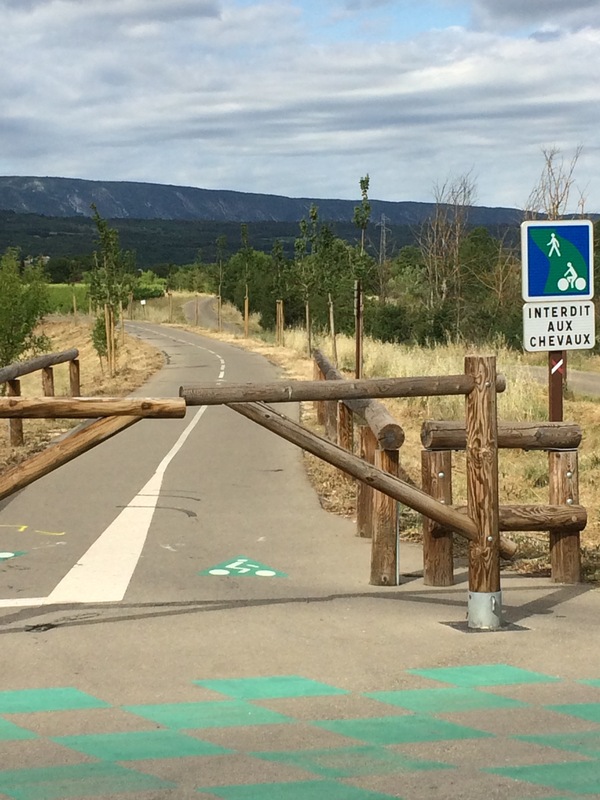 A new bridge has now been built to take cars & other traffic and the original Pont St Julien now forms part of the cycle trail, taking bikes across the river and on towards Coustellet. 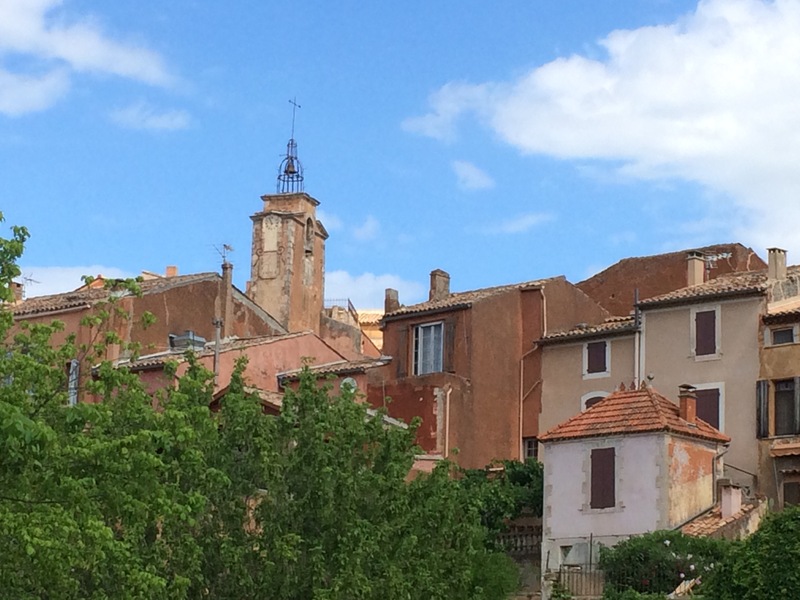 Today though I turned off the cycle route, crossed the main Coustellet to Apt road (the roundabout means this isn’t a problem) and started to head up the road the leads to Roussillon. I seem to remember that the first time I cycled up this road I thought it was a hideous climb, but actually I now realise that it really isn’t! 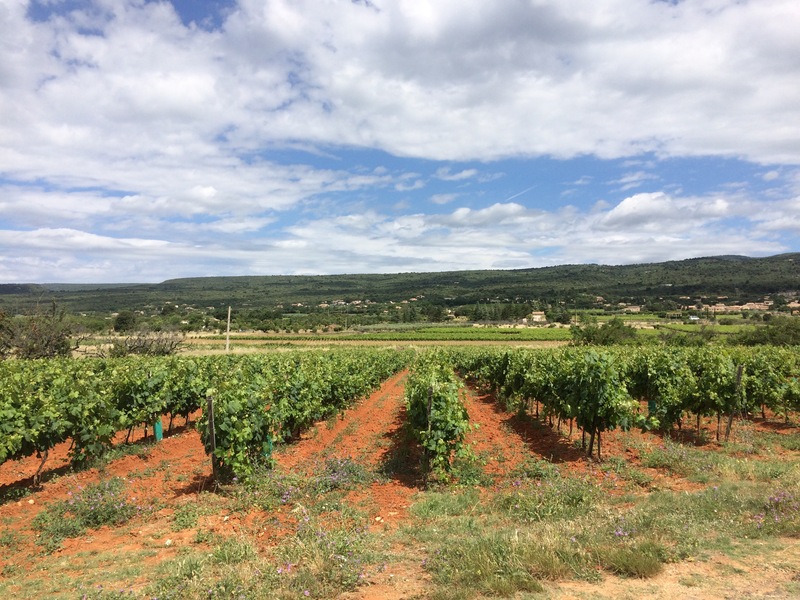 The road climbs slowly through the hamlet of Les Huguets, before passing through vineyards & into the shade of pine trees, where the ochre soil becomes more and more apparent. 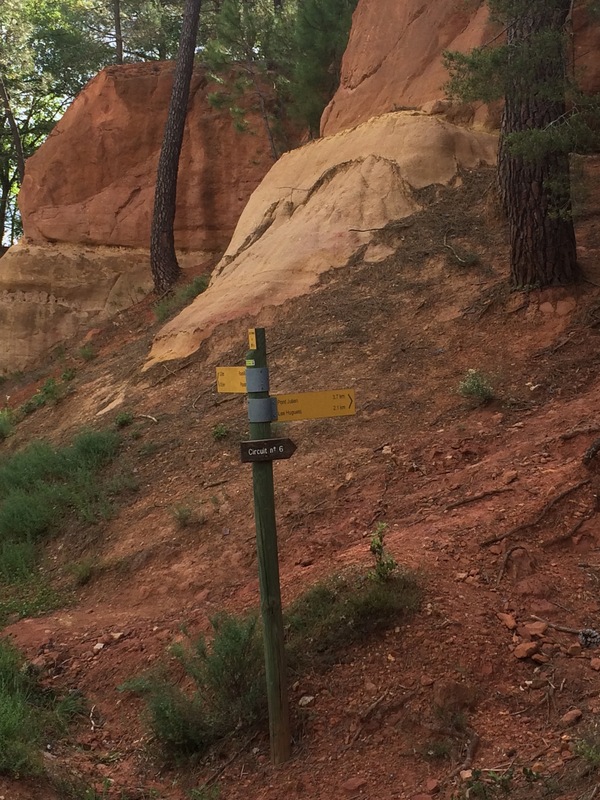 This area is riddled with well-marked footpaths & many of these are worth exploring, particularly the ones that lead to the old Ochre quarries above the very smart ‘La Coquillard’ hotel. 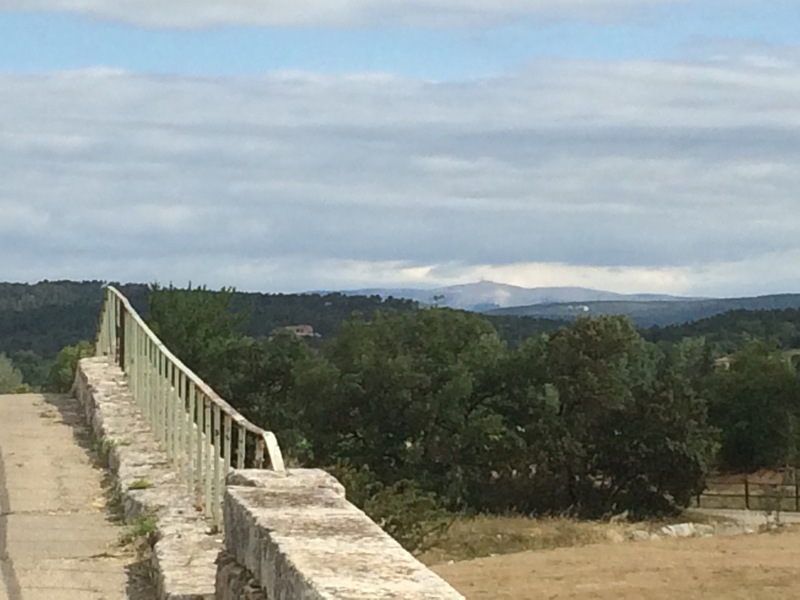 After about 4km the road levels off on the final approach to Roussillon. 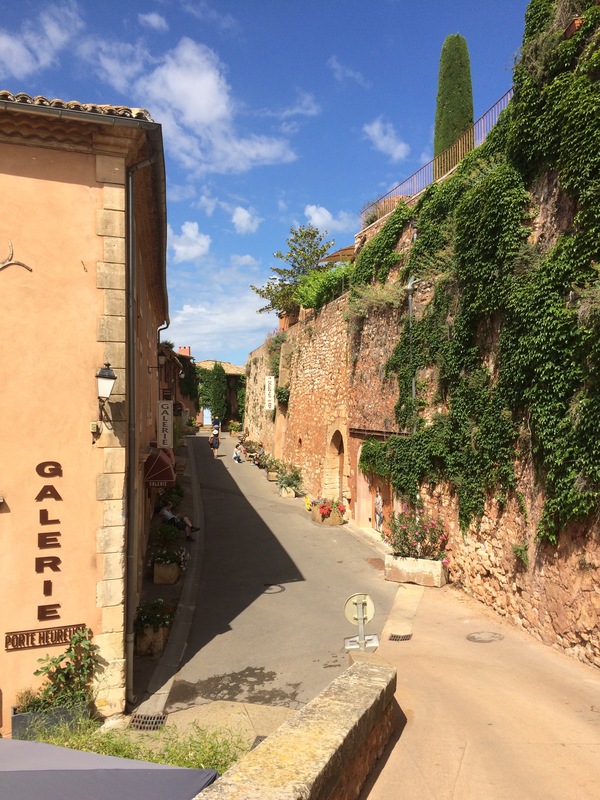 Roussillon is a stunning little village, with the houses all painted in bright colours, derived from the Ochres that make up the cliffs and soil around it. It doesn’t matter if it’s a grey day – the village always seems to glow. It’s home to a number of galleries & pottery shops and I inevitably find myself particularly taken with one thing or another, which makes cycling a great option as I really can’t buy anything! 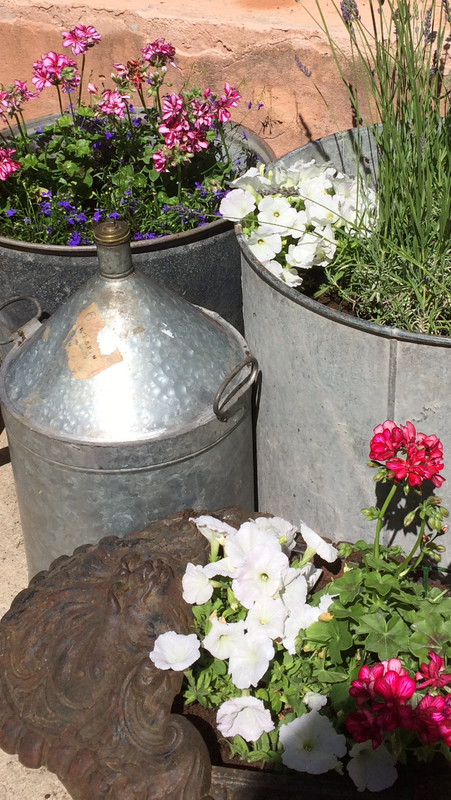 A perfect coffee stop ! Suitably refreshed I headed off again, following the road that drops out of the back of the village towards Saint Saturnin, to pick up part of the Circuit des Ocres, which heads on towards Rustrel. 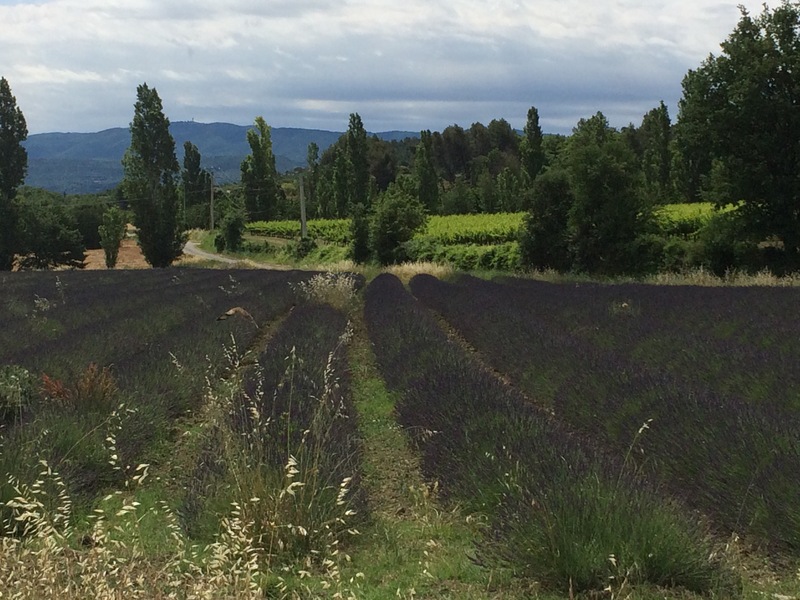 It was certainly worth taking this road today as the lavender fields are just coming into bloom and dotted between the vineyards & fields of ripe corn were the dark purple stripes that are so much part of Summer in Provence. 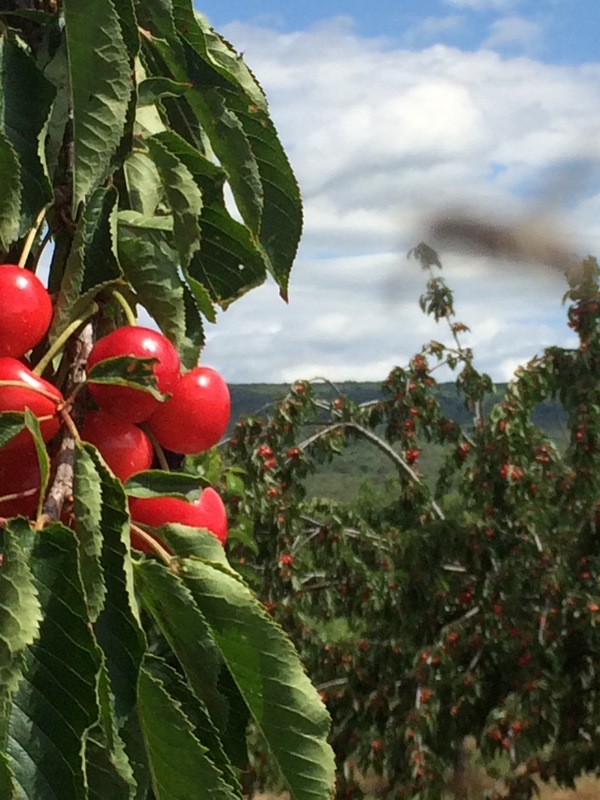 The road also passes through large cherry orchards & on some trees the branches were almost touching the floor as they were so heavily weighed down with the bright red fruit. The beauty of being on the cycle route is that the ride takes you along quiet back roads and although I passed quite a lot of people out walking- I was only passed by 1 car during the ride back, which is my idea of a perfect route. 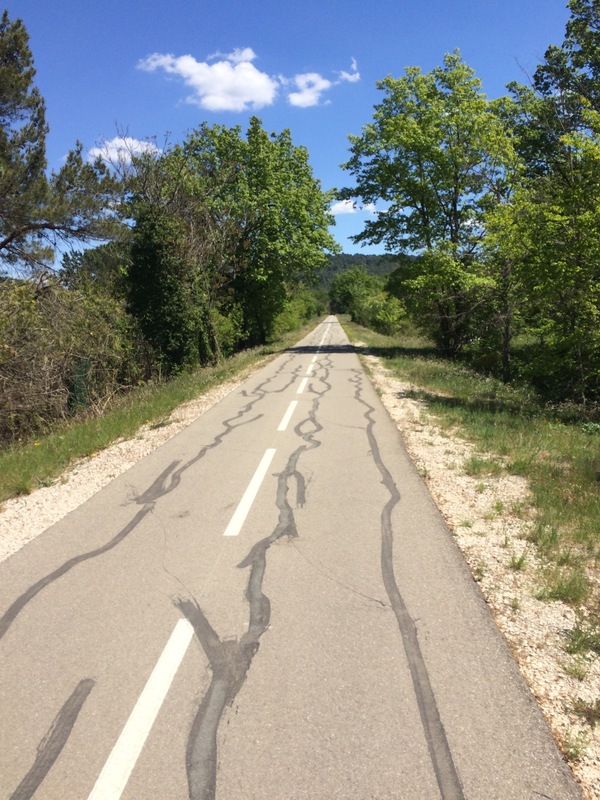 Just before Saint Saturnin I turned right & dropped back onto the road back towards Apt, where I rejoined the Veloroute du Calavon & headed home, arriving in plenty of time to go scavenging at the local recycling centre. All in all a lovely little morning’s ride & the pleasure that comes with my first sight of the dark purple lavender this year! Just perfect …. 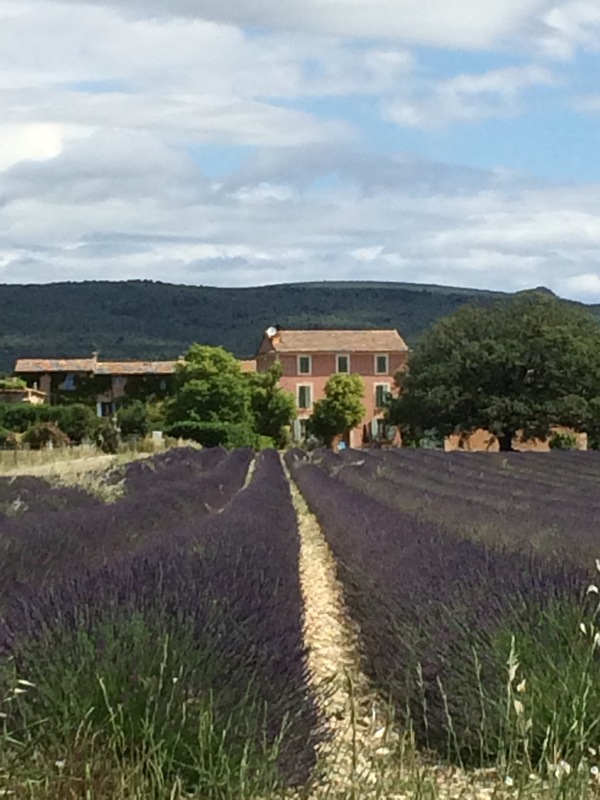 Thanks – the lavender is really exploding into flower now – the scent as you cycle is wonderful ! Winter has hit here in Australia and, as every year, it has taken us by surprise. It was nice, therefore to imagine myself in your colourful pictures, warm, sweaty and happy!